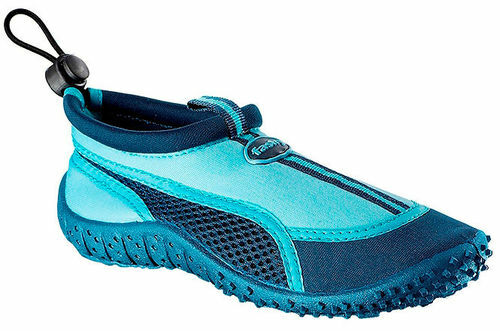 Fashy childrens' waterproof and comfortable shoes, protecting the foot, the heels and sides of scratches, glass, sharp stones and similar injuries. A sturdy neoprene fabric allows you to feel comfortable, without having to tie the shoe laces or otherwise tighten your foot. The toe is thick rubber. Perfect for kids playing on the beach or in the pool. Upper part: Neoprene with a mesh.